After a life of longing for a horse, my wife finally was able to fulfill her heart’s desire this summer. So we have new member of the family, Sassy. She’s an 8-year-old Missouri Fox Trotter. Of course, becoming a member of our family means you must have your picture taken frequently. 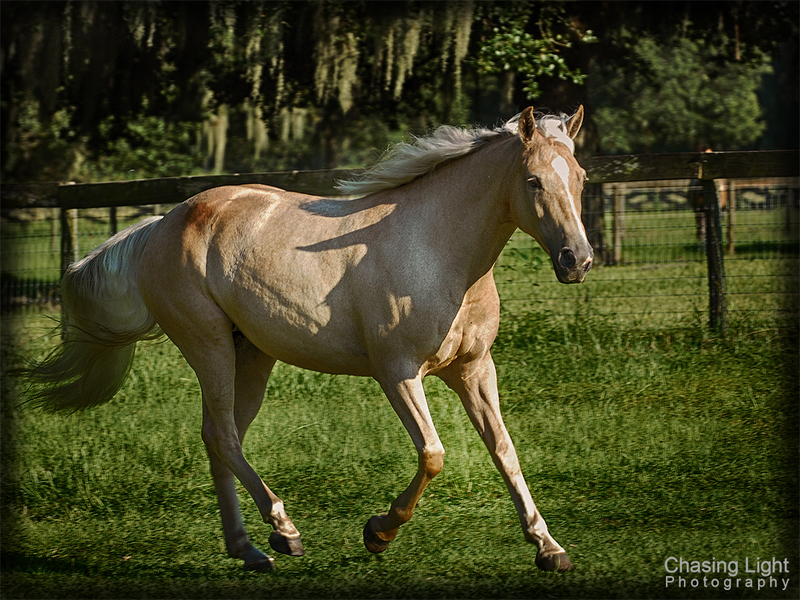 Last weekend we had our first real chance to take a few snaps of Sassy. This was a learning experience for all of us. The idea was to get Sassy in all of her fox trotting glory. This means she needs to be running (cantering, galloping, something — I’m still not sure of all of the terminology). My wife thought that if we put a bucket with carrots at one end of the pasture and let her go, she would run to get the carrots. No such luck… She didn’t even walk to get the carrots; she just stood there and grazed. So we took a few shots with my wife and Sassy. We haven’t tried the flash yet. There’s no telling what reaction that will bring from Sassy. We’ll save that for another day. There was one time when we knew Sassy would run. 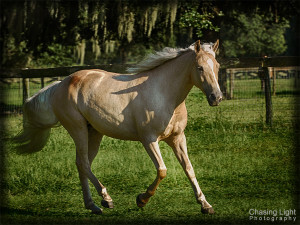 When she gets turned out into the pasture every night, she always runs for about a hundred yards before she starts grazing. So we turned her out and I positioned myself to get some shots. 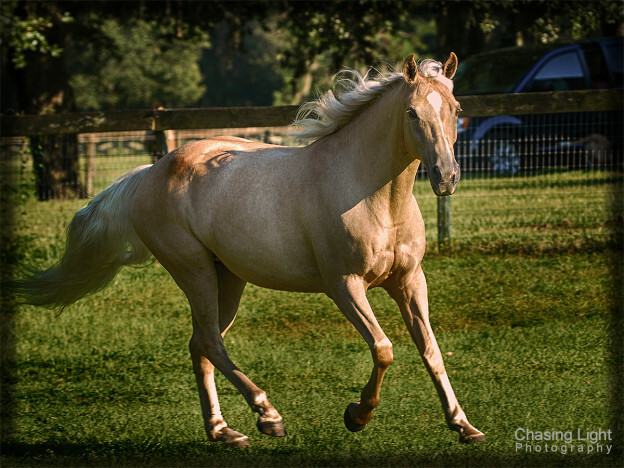 Here are a few lessons I learned on my first attempt at equine photography. My first thought was that late in the evening we’d get nice lighting on Sassy. While we did get reasonable color, the shadows cast by a big animal are hard to predict and somewhat distracting. I think a cloudy day with flat lighting will be better. Second, you’ve really got to keep the frame rate going as fast as possible. What my wife wanted to see from the picture was the classic Fox Trotter gait. This means that only one foot will be on the ground as she runs. You can see it in the pictures, but the front left foot is almost touching the ground. If I can get a picture a split second earlier in the gait, it will be easier to see the classic pose. This is something only the true gaited horse lover would notice, but this is also the audience for the picture. We didn’t have much choice where we turned Sassy out that evening, but one of the best shots from the quick dash has a minivan in the background. If I had noticed the parked car in advance, I probably could have positioned myself a little better to avoid it. Unfortunately, once she was turned out for the evening, we weren’t going to get a second chance at the shot. Sassy is definitely not a cooperative model. She’s going to do her thing, and you have to know enough to predict her behavior and capture the decisive moment. We’re still learning about Sassy’s behavior, but it’s getting better. I’m sure each time we try to get the perfect portrait we’ll learn a little more. This entry was posted in Photography, Tips & Techniques on September 6, 2013 by Michael Weeks. Good work getting the posture and light working together. I have found that photographing horses just after or before training session is hard. At that time they usually rather ignore people or have too much interest on what is going on. You’ll get a dull posture or close up from horse’s nose. To avoid the close up from nose generally you need someone else trying to control the horse. It helps a lot to spend some time controlling horse from ground. Surprisingly you can get some control on the horses movement & angle to the light even from behind camera.